The Polar S610i heart rate monitor is an intermediate/advanced level heart rate monitor for runners in the Polar S series. The S610i is essentially the same monitor as the S410, but it has two main additional features: it has a much greater memory capacity for recording heart rates and it uses infrared technology to communicate between the wrist watch receiver and a PC. 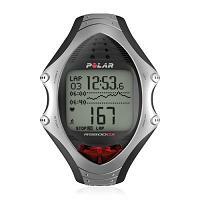 Polar Fitness Test: It gives OwnIndex and predicts maximum heart rate. Record your heart rate in 2 ways: Basic Use or Exercise Set. Basic Use: You exercise without any settings. Exercise Set: Choose between Basic Set and Interval Training Set. You can preset up to 5 Exercise Sets. 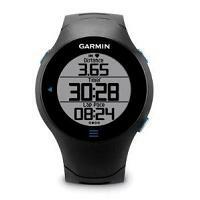 Basic Set: You can set up to 3 heart rate training zones and up to 3 consecutive timers and a recovery calculation. Interval Training Set: This consists of a warm up phase, followed by up to 30 repeating interval (and recovery) phases, and finally by a cool down phase. You can choose 3 types of interval types: time-based interval, heart-rate-based interval or manual interval. You can also program a time-based or a heart-rate-based recovery calculation at the end of an interval. 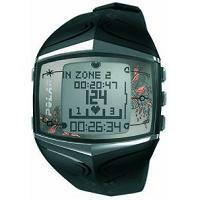 Heart rate zone alarm can be turned on or off. Record lap and split time up to a max of 99 laps. Real time information display: Current heart rate, average heart rate, heart rate as % of Max HR, stop watch, time of day, split and lap times, lap number, calorie count, memory left and recording rate. It can record heart rate at 3 sampling rates: 5 seconds, 15 seconds and 60 seconds. When sampling at 5 seconds, it can record for up to 22 hours and 3 minutes. At 15 seconds, it can record up to 66 hour and 10 minutes. At 60 seconds, it can record up to a total of 260 hours. 99 complete file: Date and time of exercise, duration, average and maximum heart rates, recovery value, limits of target heart rate zones, time in, above, below target heart rate zones, calories burnt, cumulative calories burnt, cumulative exercise time, detailed interval training information, detailed lap information. Samples file allows you to recall all the recorded heart rate samples, with each sample showing the heart rate and the time when the sample was taken. Polar UpLink to transfer data from a PC to the Polar S610i heart rate monitor. Requires a Windows PC with a sound card and loudspeakers or headphones. Coded analogue wireless transmission from its chest strap. PC communication via infrared technology. This requires a PC with a IrDA port. If it doesn't, then an optional Polar IR Interface for USB (or RS 232) port is required. The IR technology can perform both download and upload. Polar Precision Performance Software (PPPS) : Use it for detailed analysis of downloaded training data (complete file). It can also be used to prepare settings which are then uploaded to the wrist watch receiver. Some special settings include 7 alarm sound reminders, 3 display alternatives when Heart Touch is activated and options lock (which locks your options while you are exercising and can only be unlocked using the PPPS). Note: The additional S610i features over those of S410 are denoted in bold above. Comparisons are not made between the S610i and the S520 because the S520 is effectively the S410 plus cycling features. It is thus more appropriate to compare the S610i and the S410 together. 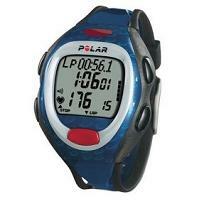 The Polar S610i heart rate monitor is basically the same heart rate monitor as the S410 in terms of basic features but it does a much more detailed recording of your exercise heart rates, providing you with all the data points you need for sophisticated analysis using the supplied software. It also has a little infrared window on the wrist watch receiver which is used to communicate with the IrDA port on your PC or laptop. If your PC does come with an IrDA port, then you do not need any extra equipment for both the uploading and downloading of data. This is unlike the Polar UpLink (which uses loudspeakers) and Polar SonicLink which uses a microphone. 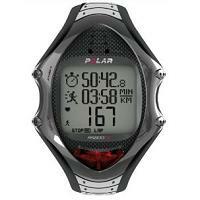 The next monitor in the Polar S series is the Polar S720i heart rate monitor.